The Projections page has been updated for the next GW and the remaining 5 GW. 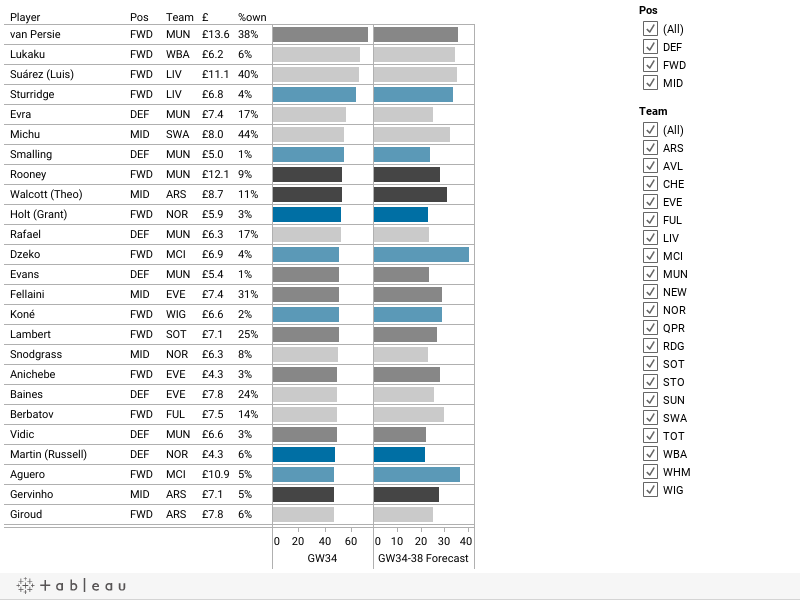 Double Gameweeks are included with Chelsea, City, Tottenham, Wigan, West Brom and Swansea all getting a double in GW36. Time to all rev up to that then. Dicing quickly through these fixtures my focus personally is going to be on Spurs and City, with Bale a priority to resign, Tevez a high probablity, and a firm eye on Aguero and one of Silva and Yaya. Doubling up on City defence might be worthwhile too. Cheaper optiosn from Wigan and West Brom could do well, I wish Lukaku could be trusted to start every game. I assume this is based on if that player would start every game? Also why no Nasri? It is assiming every one gets to play. I kept leaving players out of this and they#d end up playing! Nasri should be in their but he's not showing up for some reason. I will have to check it out.